Sorry I'm a bit late again, I got sidetracked earlier this evening. I blame the Narrowboat Waiouru blog I came across today. It's from a couple building and outfitting a narrowboat at the boatbuilders in Aldermaston Wharf, from where I'm writing this. But after this back to the Friday Islay picture. The last Friday Islay picture for this year. And it's kind of in line with the weather this year in many parts of the UK, certainly for the second half of the year after the drought in the south early in the year. 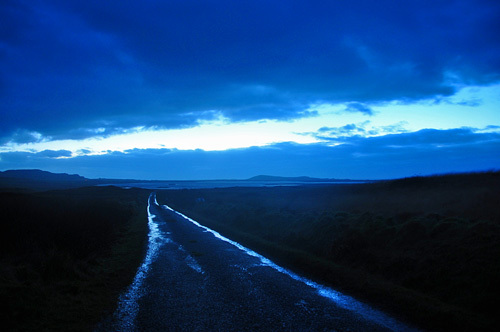 This picture is from my visit in November, from the road between Gruinart and Loch Gorm. The clouds were breaking up after some very heavy rain. The water was running down the sides of the road towards Loch Gorm. If memory serves me right there were some serious puddles further down the road. Still, I somehow like the moody and dark atmosphere in the picture. Especially as I returned to the cottage at Kilchoman soon after to enjoy a wee dram of Laphroaig at the open fire.